Hand model Larva giving everything for the "Beastly Bijoux" photos by Albert Sanchez & Pedro Zalba. Disturbing manicure by Debbie Leavitt. 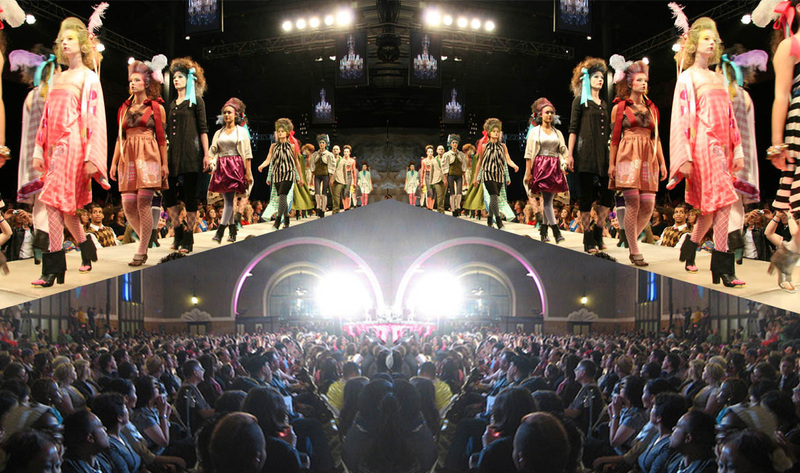 Jared Gold Czarina runway event pushes Los Angeles Union Station to capacity. A group of friends join forces to make something singularly wonderful. Set up small town fashion house, open 5 retail stores, trade on the NASDAQ, hold runway events for 2000+ people, crystalize cockroaches, and never slow down in the endless screen print deathrace-- Fall in love with fashion in cold places. Salt Lake City was everything. Catalog contains all the screen prints, merchandise, retail interiors, events, promotional materials, and a look inside studio life; the daily surroundings of the Black Chandelier studio. The staff of Black Chandelier. Designers, screen printers, photographers, and inventors. Photo by Steven Stone in the studio basement in Salt Lake City. Click here for a who's who in the photo, and who is missing. Early clothing and screen prints - fashion ideas and garments that range from questionable to unforgivable. Idaho Rave Photos - Art and Craft driven rave... Mormon Church house, lick-able wallpaper,limousines, transvestites and hundreds of piñatas. House Jugular inspiration editorial photos by Frank Armstrong. My Parents allowed me to paint a Lichtenstien mural on our garage door in Idaho, it was my brothers' basketball court. My mother sat on a kitchen chair in the alley while I painted at night to keep me company. The polaroid camera that took this photo was just like Andy Warhol's, so of course I loved it. My home life was filled with creativity, music, and a dreamlike obsession with all things wonderful.